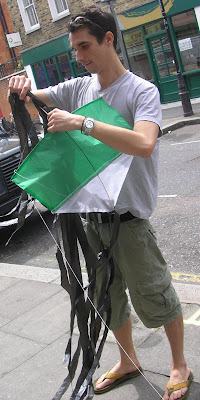 Dan popped in this morning to buy some of our 50p cotton thread, and then came back 10 minutes later with this beautiful kite, made from green and white tissue paper, with a long flowing black plastic tail. azil, kites actually kill people. Fighting kites are made by gluing broken glass onto the string and unfortunately every now and then a kite slits someone's throat. 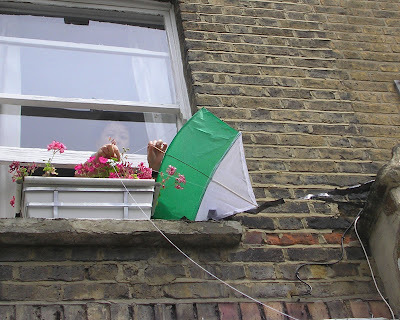 Anyway that didn't happen to us, but the kite did get stuck in the next door neighbours window box, and she very kindly freed it for us. 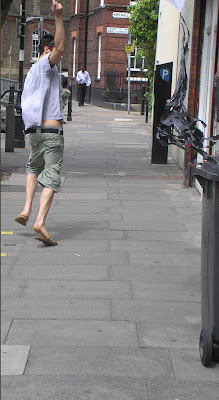 A gust of wind came and Dan and his girlfriend skipped off to the park in the gay June windy sunshine.